Hi everyone! Yay! 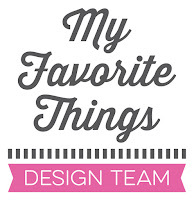 It’s time for the My Favorite Things July product launch! Today, you can see all new products and they are available right now on the MFT online store! To create these colorful balloons, I used the Big Birthday Balloons Die-namics set as masks. I cut them out from masking paper and used the negative spaces. I sponged the balloons with several Distress inks. I left a tiny white border around each balloon to give a 3D effect and make them "pop" (lol stand out) even more. I drew strings with a black pen. 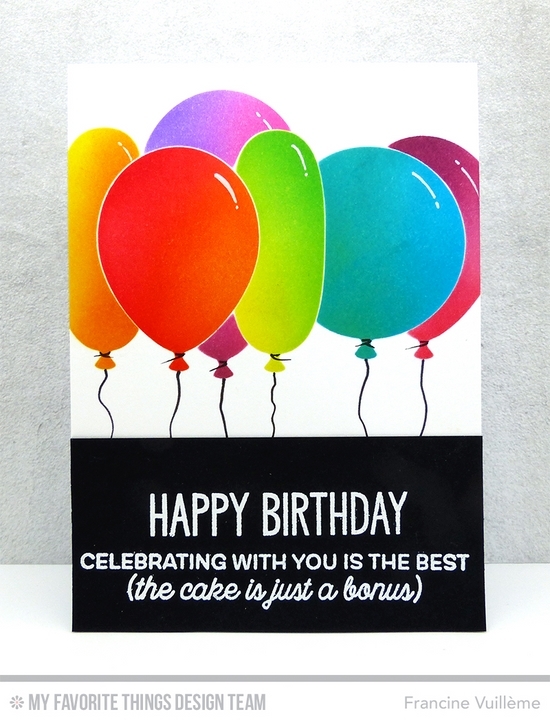 I stamped the sentiment from the Big Birthday Sentiments stamp set with Versamark onto Black Licorice Prestige cardstock and heat embossed it with white embossing powder. Love these big colorful balloons. I love what you all have done with this new release. I want everything!!!! Fantastic card! Love the bright fun colors of the balloons. The sentiment really stands out against the black...awesome! Great tip on leaving a white border around the balloon. Love hiw bright and. Olor full,your card is. Love the bright colors! What a perfect birthday card!! Your masking and coloring are flawless! This card is gorgeous. The colors of the balloons are so vibrant. They look real! Beautiful card. Love the bright colors .... cute card! I love these balloons! They look almost 3-D! Super coloring! Wow what a crisp beautiful card! I almost thought it was a photograph! WoW! Your colors and balloons are eye-poppingly Gorgeous! Love this! Love this colorful card! Great work! Oh so bright and fun! Wow your balloons look real. This card is so striking!! The balloons are so bright and the black sentiment piece below makes them POP. Beautiful design! Great use of bold color! Those balloons look amazing! Love the bright colors. Oh my goodness, those balloons are so fun and festive! Love the bright colors. Beautiful blending Francine! and such a great design! Wow! Love all those colors. Beautiful card! This card is amazing! I love the little white space you left around the balloons. I also love that it would be perfect for a masculine card, which are always harder! Beautiful sponging! Such a bright and cheerful card! Your card is so inspiring. Thanks for sharing!! Love that rainbow of balloons! Wonderful design! Wow! Beautiful funny and colourfully card!!! Love your balloons. The dimension you created is awesome! WOW! You really made those balloons pop right off the page. Love this card. The white border definitely breathes life into these balloons and makes them pop off the page. Such a wonderful card! Love your fun and colorful card Francine! Great card... just LOVE those big beautiful balloons! Cheers. All of the beautiful balloons really say Happy Birthday! Well done! Those balloons really pop, love how colorful they are. Terrific masking tip for that fun bunch of balloons! This is gorgeous! I love the bright colors! Such vibrant colors! Love it! Love those bright colors for the balloons! What a festive birthday card! What a fun colorful card. Nice shading. They didn't look crafted. Amazing card! Looks simple, but a lot of masking and beautiful blending going on. Love it! Great design, I love the contrast between the bright colours and the black, so striking! Those balloons are so vibrant! I love it! These colorful balloons. What a great card. You did a great job overlapping them. Another beautiful card! Your ways of creating designs in fabulous ways are amazing. You've inspired me once again! I love your work. Great job. Love those festive balloons! Awesome colors! What a lovely card, so colorful. Absolutely stunning Francine! I love the colors. Great card. Your coloring is fantastic. Love your coloring. Fabulous release. Love that sentiment! Super cool card! wow.. those balloons are so gorgeous!! fabulous card! WOW! Francine, this card is AWESOME!!!!!! What a fun, festive card - love the bright, cheery colors! Beautiful card. Such bright colors. Like the beautiful rich colors you have on those balloon. They are a great CAS card; I really love it. What a fabulous way to use the Balloon Die-namics! I love the coloring of them, and the white outline adds great dimension. I love your card. The balloons are so bright and happy. I love how you used your DI's to ink your balloons...so much dimension, and the colors really pop! Another fabulous card, Francine! Oh wow--one of my favorites! Love all the bright balloons & the black strip across the bottom is perfect! What a bright and happy card. I love how the black grounds it. love the colorful balloons you created! Eye catching card! Love the colors against the black. This is a fab card. I hope you can show how you did the masking here. Love it. Wow! This card is Gorgeous!!! Great card! Love the masking! this is fabulous can't wait to try it ! Fabulous card! Bright & cheerful, perfect for a birthday! Fun balloon shapes with great colors! Love your happy, festive design and fun colors. Beautiful card! Love the balloons! Bright, BEAUTIFUL and perfect Birthday card - I love it!! I love this release and the great work the team has done!